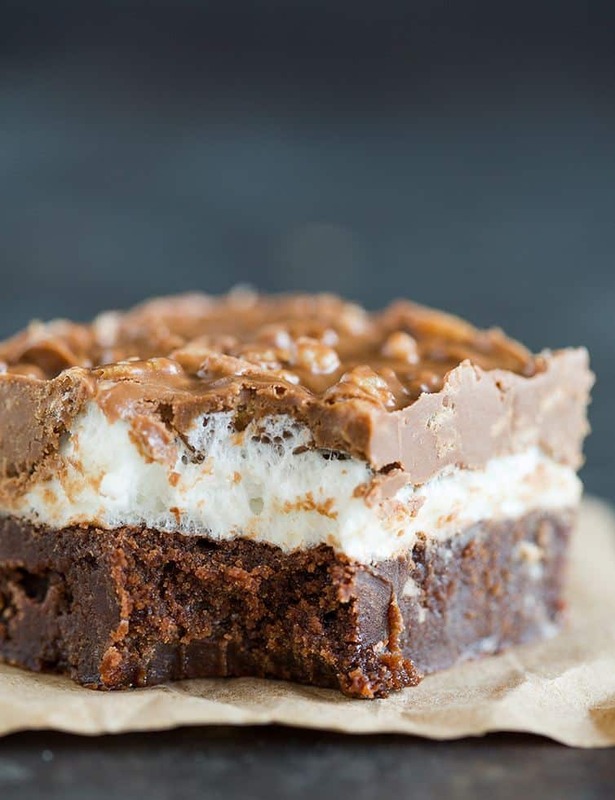 Super fudgy brownies topped with a layer of marshmallows and a chocolate, peanut butter and Rice Krispies mixture. Imagine this: rich, decadent brownies. Topped with ooey, gooey marshmallows. Topped again with chocolate-peanut butter-Rice Krispy deliciousness. 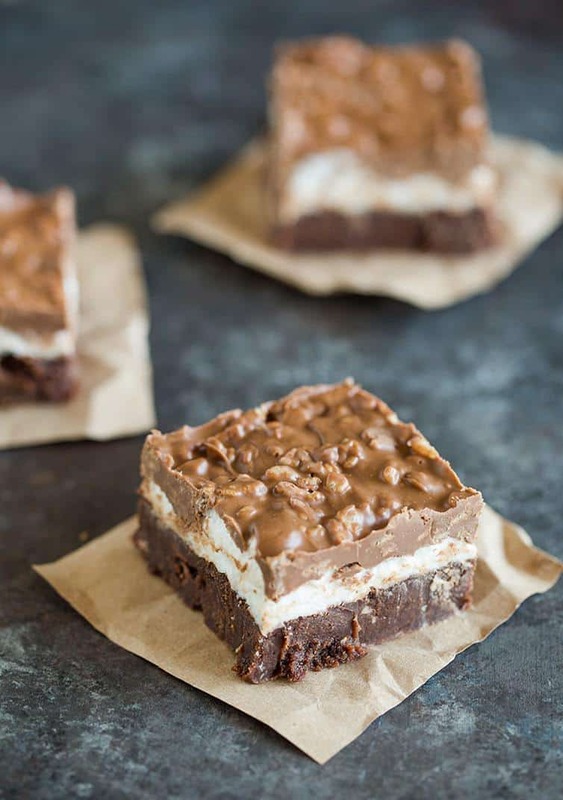 If you love fudgy brownies and can’t resist crazy brownie concoctions, you are absolutely, positively going to love these brownie bars. Part brownie, part s’more, and part Rice Krispy treat. It’s everything you know and love, baked up into one amazing dessert. These were my go-to party dessert for ages (I eventually made a peanut butter cup version! ), and I recently revived the recipe, much to the delight of everyone in my family. I am keeping the brownie recipe the same below in case anyone wants to keep using the original recipe, but I totally recommend using my better-than-box-mix brownies as the base recipe. 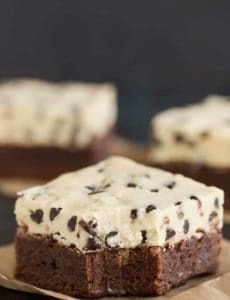 It’s my go-to brownie recipe and I think it’s the best first layer when making crazy brownie concoctions. We had to go peanut-free in our house since finding out about Joseph’s allergy, and I have successfully made these with Sunbutter in the top layer. It tastes delicious and I had no issues with it setting up. (I used the Sunbutter Natural version with the yellow lid; I can’t speak to the other varieties). Now, you’ll want to hurry up and make these immediately. All of your family and friends will love you forever. Make the Brownies: Preheat the oven to 350 degrees F. Grease a 9x13-inch pan. In a medium saucepan, melt the unsweetened chocolate, butter and ¾ cup of the semisweet chocolate chips over medium heat. Stir occasionally while melting. Set aside and cool for 5 minutes. In a large bowl, whisk the eggs thoroughly. Add the sugar and vanilla, and whisk until well blended. Stir the melted ingredients into the egg mixture, mixing well. Sift the flour, baking powder and salt into the mixture and stir well. Fold in the remaining ½ cup semisweet chocolate chips. Pour the batter into the prepared pan, smoothing it into an even layer. Bake for 25 to 30 minutes, or until a toothpick inserted into the corner of of the pan comes out with moist crumbs. 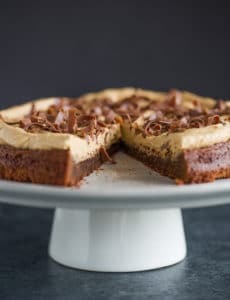 Make the Crispy Chocolate Peanut Butter Layer: Meanwhile, place the milk chocolate chips, peanut butter, and tablespoon of butter in a medium saucepan. Melt over low heat, stirring constantly, until completely melted. Remove from heat, add the Rice Krispies and mix well. Allow to cool for 3 minutes. Spread the mixture evenly over the marshmallow layer. Allow to cool to room temperature, then refrigerate for 30 minutes to make it easier to slice. The brownies can be stored at room temperature or in the refrigerator for up to 1 week. Do not use natural peanut butter, as it is too oily. I have made this successfully with Sunbutter (the natural version, with yellow lid) in place of the peanut butter with no issues. 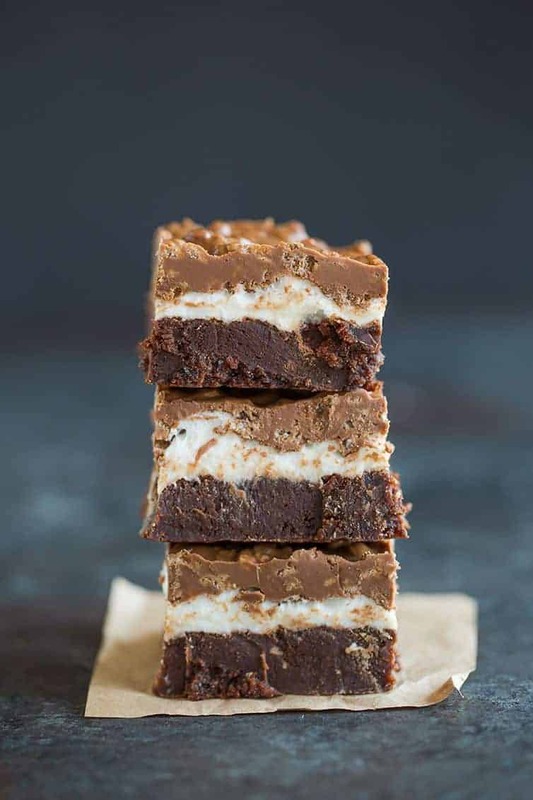 Since originally making this recipe, my better-than-box-mix brownies have become my go-to recipe for brownie creations, so I recommend using that one as the base! This recipe was originally published on October 5, 2009. The recipe sounds tempting and the photos look scrumptious, sadly these didn’t turn out well at all. I baked them for 23 minutes and that was already long enough to turn the batter into dry, crumbly cake. The marshmallows needed longer than just three minutes to melt and that probably didn’t help the moistness of the already dry batter. The peanut butter, chocolate rice crispy frosting was ok, however, I used semi sweet chocolate because I feared they might be way too sweet. I have to say, they are inedible and I absolutely hate to throw food away. The marshmallows have turned into gum, and when taking a bite, the batter layer disintegrates in your hands. I’m not new to baking and I use quality bakeware – made these in one of my anodized aluminum 13 x 9 USA Pan and never had problems with them. May I substitute marshmallow fluff instead of the mini marshmallows? Hi Sara, You can, but the texture of that layer will be much different and way messier/gooey-er. I made this recipe over the weekend. Overall, my family found it too sweet (is there such a thing?). They described it as “over the top.” I have a high tolerance for sweet. I like it, but am only able to eat a very small amount at a time. The top layer definitely needed time to set-up in the fridge before serving. However, once it set, it gets too hard if stored in the fridge. I made these last weekend, and I absolutely love them!! 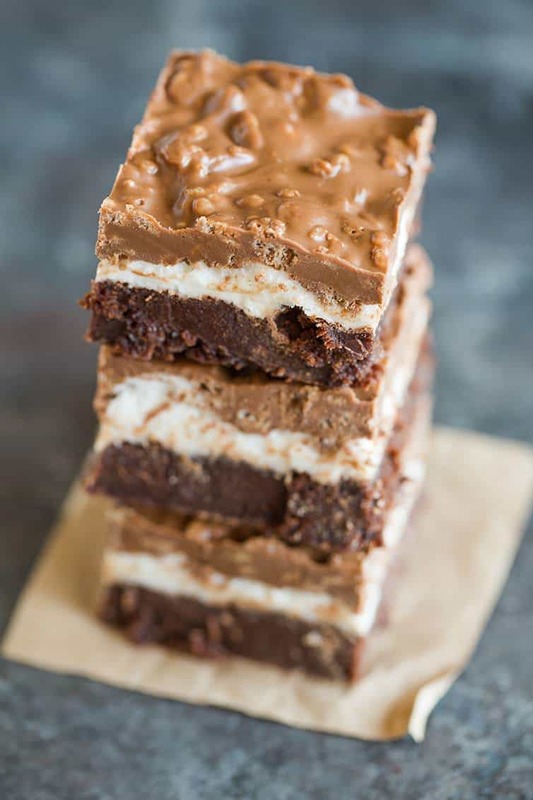 Delicious brownie base (wow, I could eat a million of those by themselves), made even more magical and delicious by the marshmallows and crunchy top layer! I kept the extras in a tupperware in the fridge, which made for an easy late night treat. Yum! Wow ! So yummy Big hit ! Thank You from a brown eyed baker too. These look like gooey sweet heaven! I love anything with chocolate and peanut butter and this is yet another awesome way to enjoy them together. Can’t wait to try making them! Wow! So decadent and delicious! Such a great recipe!!! Lovely blog, added you to my follow list. This recipe looks delicious! I can’t wait to try it this weekend. Ahhh….these look so intensely good! I’m drooling! These bars look amazing! I need to try and make them asap! Your photos SLAY me! These look amazingly nom!! Healthy and delicious. Looks like a piece of art. Thanks for sharing. I’ve baked many Browneyedbaker’s recipes and I can’t wait until these come out of the oven! I had to jump back onto the computer because step #6 didn’t print so…… the batter tasted yummy, and I’m sure a hot marshmallow brownin is going to taste even better! Made these yesterday for school staff year-end appreciation treat. Next time, I will allow to cool for an hour before adding/spreading the choc peanut butter topping. I think it will help it spread easier. They cut easily and perfectly with a sharp nice, and look beautiful in a platter. Of course, I got some high-fives!!!!!!! These were amazing, very rich. My family gobbled them right up! Some questions…Some said this bar was way too sweet and suggested using bittersweet chocolate. 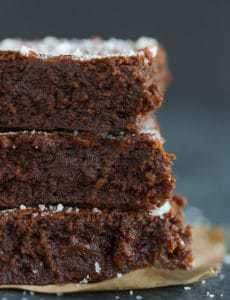 Would cutting back the sugar in the brownie have made any impact on the sweetness? Also, would melting and combining the marshmallow, rice cereal and chocolate together solve the issues faced with marshmallow bubbling up when trying to spread it rather than making them two separate layers? Third, would making these in a cupcake tin (regular or mini) and then top with marshmallow followed by the chocolate/rice mixture or a mixture of all 3 work? It sounds like a great treat but if they are too sweet, it is a turn off. Hi Dianna, I definitely think that things like sweetness, spiciness, etc are extremely subjective, as everyone’s taste buds are completely different. What might be too sweet or too spicy for one person might be just right for another. I’d recommend making the recipe as-is, then determining if you want to make any adjustments (I actually recommend doing this for any new recipe).